Description: The bad men and women who roamed the Pacific Northwest in the early days never have received the recognition of their counterparts in other parts of the West, although their exploits often exceeded those of better known outlaws. 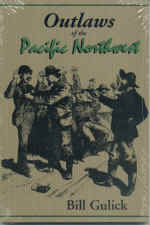 In Outlaws of the Pacific Northwest, Bill Gulick rectifies that historical oversight. * Chief Bigfoot was a renegade giant who allegedly roamed the high desert of southern Idaho in the 1860s, bringing death and destruction to the early settlers. * Sheriff Henry Plummer's gang may have murdered more than 100 people in the Montana mining camps before outraged citizens gave him a "suspended sentence" on his own gallows. * Josephine Wolfe was a Walla Walla institution. When "Dutch Jo's" house was quarantined, the mayor, police and fire chiefs, two ministers and six merchants were marooned there for two weeks. * Gunfighter Hank Vaughn cut a wide swath for years in eastern Oregon. The last of the area's professional hellraisers died with his boots on ... when his horse slipped on a new concrete sidewalk! These are just a few of the colorful characters you'll meet in Outlaws of the Pacific Northwest. 6x9, paperback,216 pages, photos, map.